Anyone familiar with the Barossa’s fabled Torbreck Wines would have already guessed that the Powell in Powell & Son is none other than Torbreck founder Dave Powell. Dave teamed up with his 22 year old son Callum a couple of years ago to start a new small-scale eponymous wine label at the Riverside Vintners in Lyndoch. Apparently Callum’s birth in 1994 coincided with the pressing of the first vintage of Dave’s own shiraz, so you could say that Callum was born with wine in his blood! Before starting a degree in oenology at Roseworthy, Callum had a stint working under Jean-Louis Chave in Hermitage. 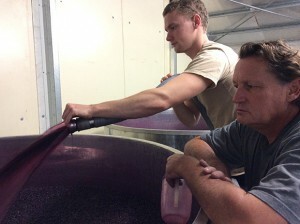 Dave is quick to acknowledge that his precocious son is already developing his own unique winemaking style. Steinert is indeed a very impressive vineyard. 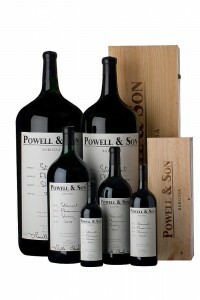 Located in Eden’s Flaxman’s Valley, the vines are more than 120 years old and cost the Powells $10,000 a tonne. Dave and Callum are relishing the opportunity to spend time together in this special vineyard, working it to perfection. The Wine Front’s Mike Bennie believes the Powell & Son new lineup of six wines shows “all the DNA of [Dave’s] past, but there’s a freshness and vitality to the wines that seems to lift them.” (The Wine Front, Powell & Son Barossa Valley Shiraz 2014, 2 March 2015). The range also includes the Loechel Eden Valley Shiraz – sourced from a single vineyard high in the Eden Valley, the Barossa & Eden Valleys Shiraz, the Barossa Valley Grenache Shiraz Mataro, the Barossa Valley Shiraz, and an Eden Valley Riesling. The future is looking very bright indeed for this father and son team!